What is American Kenpo Karate? American Kenpo Karate is an updated system of self-defense based on modern day street fighting. The system applies logic and practicality. American Kenpo Karate is a thinking art. Who are the Flores Bros.? The Flores Bros are Jesus and Refugio Flores. Both started training in Kenpo Karate in 1972 and were promoted by Senior Grand Master Ed Parker in 1978 for their 1st Degree Black Belts under the guidance of Curt Cokeley. In 1984 Jesus and Refugio Flores started training personally with Mr. Parker until December of 1990 when Mr. Parker passed away. Mr. Parker promoted both Jesus and Refugio Flores up through their 5th degree Black Belts. Jesus Flores is currently a 10th degree Black Belt & Refugio Flores is currently an 8th degree Black Belt. Jesus Flores has dedicated his life promoting the art of American Kenpo Karate. He currently runs the Flores Bros. Kenpo Karate Studio in Oxnard California, and promotes the art through his books, and seminars. Sifu Jesus truly believes that as long as he teaches he must remain a student. Refugio Flores a pioneer in the sport of Kick Boxing held the 1978 United States Featherweight Title for the International Kickboxing Association and in 1981 became the IKA World Super Featherweight Champion. 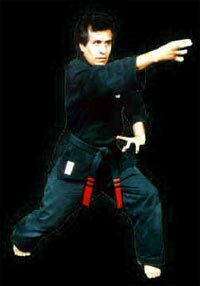 Refugio has done stunt work for various motion pictures including “Force Five”, and “The Karate Kid”. Nominated two years in a row for the Ventura County Sports Hall of Fame, Refugio became an inductee in 1987. Refugio also specializes in professional body guard training and special forces tactics. Refugio Flores is now a Master Arms Instructor at Shooters Paradise in Oxnard, CA.